It deems this title because there is little argument against the fact that this city is so extraordinary that is has no competition – it is simply incomparable to all other cities. So, for those of you who haven’t been to The City, I hope to convince you to go; and for those of you who have been but are looking for fresh ideas, I hope to convince you to follow my three suggested tourist spots. In order to get an accurate depiction of how vast and innovative New York City is, you must take a look at it in its entirety. This seemingly-impossible endeavor can be pursued by visiting the 70-story sightseeing building, the Top of the Rock. Open seven days a week from 8am to midnight, the Top of the Rock is an ideal stop at any time during your NYC trip. For an even more extraordinary experience, stop in around the time the sun is setting, and have a look at the most beautiful sunset you will ever see. 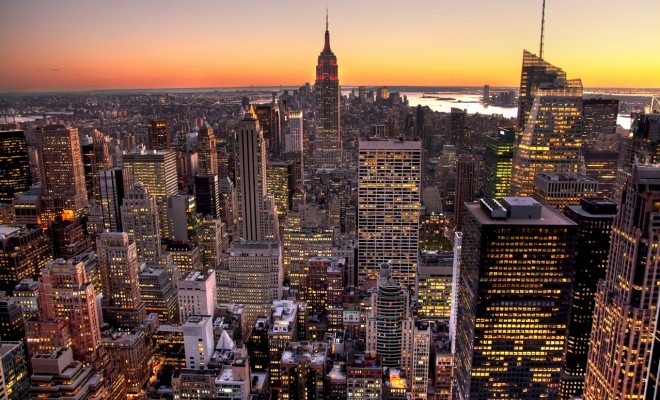 See all of New York City by simply looking out a window – stop in at the Top of the Rock! It may seem a little strange that a tourist attraction in NYC is a park, but Central Park is definitely a top New York City must-see. 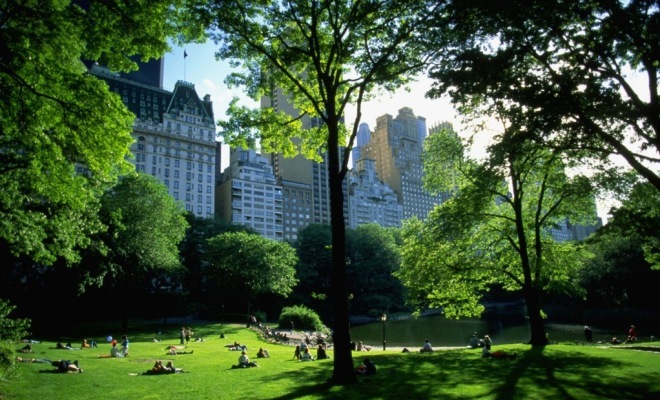 As a refuge from all the hustle and bustle of the city, Central Park is an 843-acre park filled with gardens, trees, arches, statues and sculptures. Enjoy such outdoor adventures as biking, hiking, ice-skating, and picnicking. In the wintertime, enjoy the beautiful snow-covered landscapes, and in the springtime, marvel at the colorful, blooming flowers. Even if it’s just for a few minutes, you cannot miss out on this lovely nature experience in the middle of one of the busiest cities in the world. Known for its phenomenal theater performances, New York City has one of the most famous theater districts in the world: Broadway. Viewing one of Broadway’s featured theater shows is a perfect way to end a long day of touring. 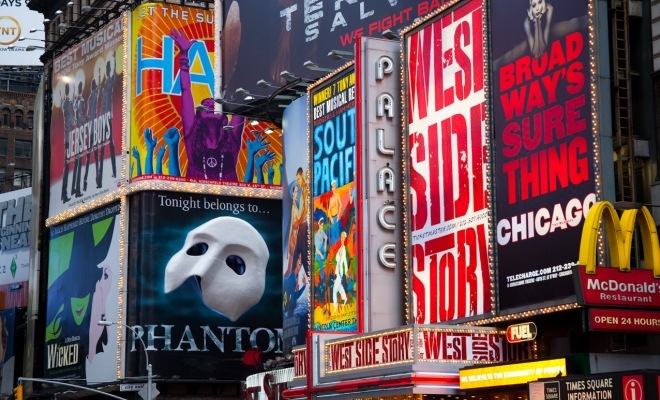 Catch a musical, a play, a kid-friendly show, a classic, a concert, or a celeb-on-stage, available either on Broadway or off Broadway. This is an incredible experience that you do not want to miss during your trip to New York City. Check out the Broadway website for a list of current shows, and to buy your tickets. 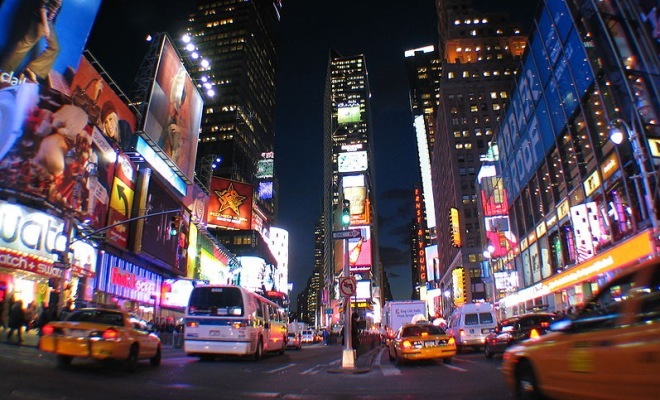 For more ideas for New York City tourism, check out our comprehensive lists of the best attractions in New York and New York sightseeing.